The correct role of infant formula companies during World Breastfeeding Week is the same as at any other time of the year: to sell their infant formula in accordance with international marketing standards – and nothing else. They should not be targeting pregnant women and mothers with information on breastfeeding or anything else to do with infant and young child feeding. But see the examples collected below during World Breastfeeding Week 2016 (WBW). Seeking direct or indirect contact is expressly prohibited by Article 5.5 of the International Code of Marketing of Breastmilk Substitutes. The role of formula companies is to manufacture and distribute infant formula for sale. Note, the other breastmilk substitutes they promote, such as follow-on formula and so-called growing-up milks, are unnecessary products according to the World Health Organisation and rip parents off. Formula companies are concerned about the progress in restricting formula promotion and the success in promoting breastfeeding through initiatives such as WBW. Instead of contenting themselves with marketing formula appropriately, they are trying to hijack WBW for their own purposes. 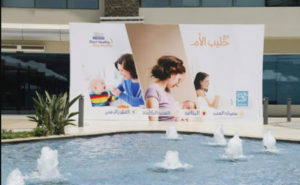 Although this is an initiative of the World Alliance for Breastfeeding Action (WABA), companies have co-opted the name – and even the official logo. They have done similarly with the name of the First 1000 Days initiative on appropriate nutrition from conception to two years of age. As I wrote in my previous post on action people can take to promote WBW, formula companies have two objectives in trying to hijack it. One: to be able claim to they support breastfeeding to divert criticism of formula marketing practices. Two: to gain contact details from pregnant women and mothers and sign them up to parenting clubs. Sometimes we see a third objective: information on breastfeeding that is either wrong or makes breastfeeding seem difficult to achieve or promotes unnecessary follow-on milks or toddler milks for when mothers “move on” from breastfeeding. If companies really cared about breastfeeding, then they should stop breaking formula marketing rules. Governments shouldn’t look for help from formula companies in promoting breastfeeding, but protect breastfeeding by regulating the formula industry effectively. Any money formula companies put into an activity is an investment in boosting formula sales and the costs have to be recovered from those sales. If companies stuck to their proper role then formula would be cheaper for mothers and carers who use it. No promotion = Cheaper formula. Thank you to everyone who has shared examples of companies hijacking WBW 2016. Here are some examples. Support Baby Milk Action’s work by becoming a member from as little as £1.00 per month. 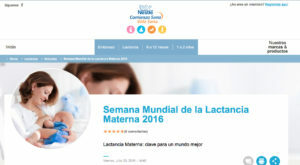 Nestlé in Mexico uses its World Breastfeeding Week website to sign mothers up to its First 1000 Days Club and encourage them to contact it for advice and support. 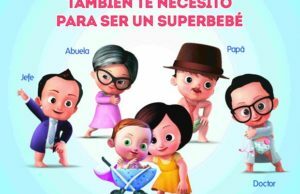 Nestlé in Venezuela is mounting a social media campaign and trying to supplant WABA as the focus and source of information on World Breastfeeding Week. Long ago, we noticed Nestlé’s strategy of promoting its formula as based on breastmilk, to turn “breast is best” messages into product endorsements. So praise for breastfeeding, when it comes from Nestlé, is not against its marketing interests. That’s why it tells investors its First 1000 Days initiative is a success in promoting its “product solutions”. 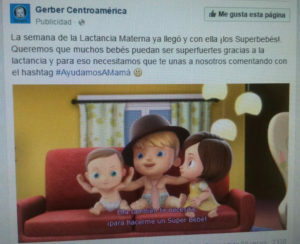 Nestlé in Central America promoted a hashtag to be used for tweets during WBW (#AyudamosAMamá). Owning the hashtags gives Nestlé greater impact when it posts its own corporate tweets. Some promote a “superbabies” video about breastfeeding, which is proving very popular. Again, there is a Nestlé baby club promoted on its site. Nestlé in India faces difficulties in using its usual formula marketing practices as the International Code and Resolutions are effectively implemented and enforced. It cannot promote infant formula, follow-on formula or other milks for babies up to two years of age. 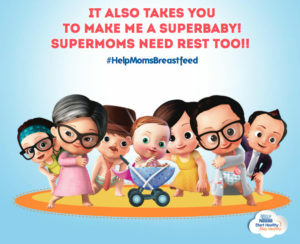 This is where Nestlé first came up with its “Superbabies” approach of targeting pregnant women and new parents during World Breastfeeding Week. This has returned in India in 2016, as well as being rolled out in other countries. 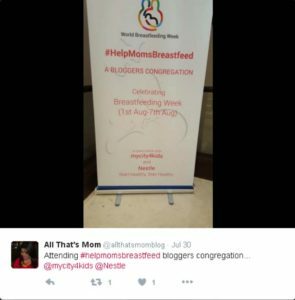 For WBW 2016, Nestlé recruited bloggers to its cause, organising a congregation in advance of the week. Again the WBW logo was used in breach of WABA copyright rules. Nestlé gives the impression WBW is its own initiative, dressing itself in the reputation and goodwill WBW has built up over the years. “Thank you for having me for the amazing initiative”, this participant tweets to Nestlé. Nestlé is trying to counter the reputation it has in India for breaking marketing laws. Formula products have been seized for breaking labelling laws, for example. 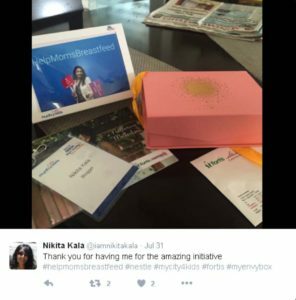 Will bloggers attending Nestlé’s events and accepting its gifts expose its malpractice in future? Two further strategies are being used in India this year. Nestlé is promoting a “Feedroom Locator” app, telling mothers where they can breastfeed in “peaceful and hygienic conditions”. The suggestion that mothers need to find a special “hygienic” place is obviously an attempt to neutralise in mothers’ minds the benefits that breastfeeding has over preparing a feeding bottle. A child can be breastfed anywhere. In unhygienic conditions a child is protected by breastfeeding, whereas a feeding bottle must be prepared with special care. The few places that appear on the map give the impression that breastfeeding is an inconvenient choice. 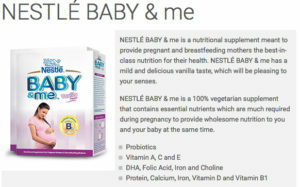 The second strategy is to direct people to the Nestlé India website, where it promotes Nestlé Baby & Me. 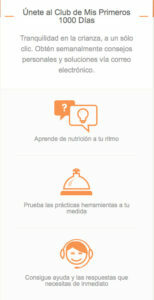 As it cannot promote formula for babies, it promotes a formula for “pregnant and breastfeeding mothers”. The strategy is clear: if mothers do not give Nestlé’s expensive processed milk products to their babies, then they should buy one to drink themselves. 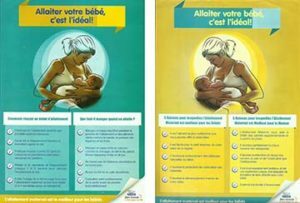 Nestlé in Gabon has used World Breastfeeding Week to co-opt midwives into promoting its Nestlé Start Healthy – Stay Healthy logo through the health care systems on pamphlets about breastfeeding. This is the logo for Nestlé Infant Nutrition – and the slogan is used for its infant feeding products. The leaflet was distributed by the Association of Midwives of Gabon, prompting debates in some of the health facilities in Libreville and prompting our IBFAN partners to pull out of joint activities promoting WBW. Nestlé uses such partnerships to divert attention from its critics. When I raised concerns with Nestlé executives at the Nestlé shareholder meeting in 2014, Nestlé displayed a breastfeeding leaflet from Cameroon on the screen in front of the thousands of the shareholders, showing its logo alongside that of other organisations. Instead of agreeing to stop practices such as promoting infant formula with the claim it “protects” babies, Nestlé Chairman, Peter Brabeck-Letmathé, said I should stop criticising Nestlé’s formula marketing practices and work with it likes these other groups. It is better for babies when organisations support IBFAN campaigns to hold Nestlé to account and avoid conflicts of interest, as in many other countries. Danone launched its own “Breastfeeding Welcome” scheme in Ireland in May, prompting complaints it was making breastfeeding appear a niche activity. 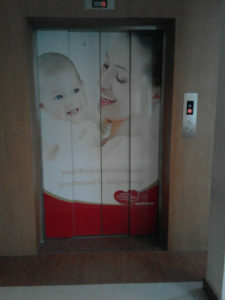 While Danone claims to support breastfeeding, in Cambodia during WBW a clinic had Danone Dumex formula branding on the lift doors (note the heart branding is the same as Cow & Gate in the UK). 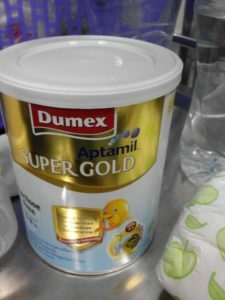 All mothers were reported to have received free sample tins of Dumex Aptamil formula. These were removed after IBFAN raised these violations with the clinic. 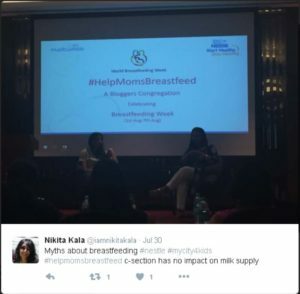 Introducing feeding bottles reduces breastmilk supply, so the company tries to shift the issue onto stress, while promoting its feeding bottle brand name. Tommee Tippee is known for promoting its feeding bottles with the idealising claim that they are “closer to nature”. 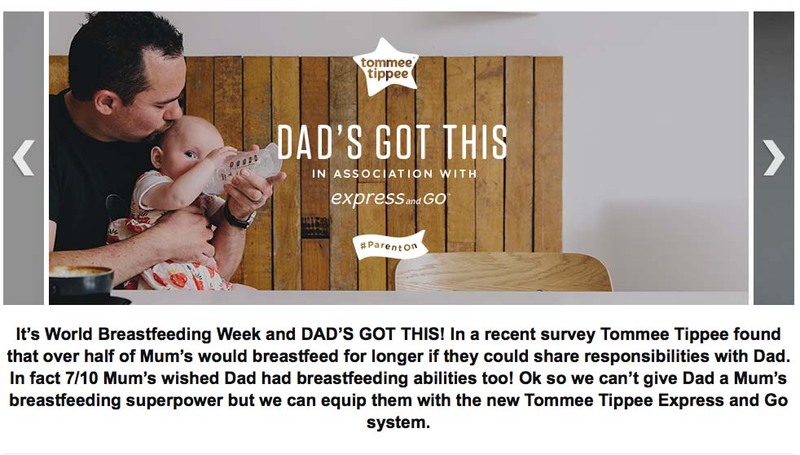 In World Breastfeeding Week it promoted breastfeeding as something Dad’s should be able to do, using the slogan “Dad’s Got This”. Is “male breastfeeding envy” a recognised condition? Advertisements on social media linked to a promotion on Amazon. 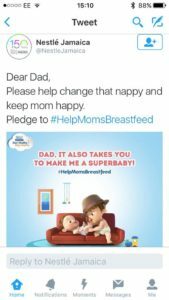 The advertisements cite a company survey implying that over half of mothers want their child’s father to help with breastfeeding. These findings are so curious we have asked the Advertising Standards Authority to investigate the actual questions put to mothers in the survey. The “Dad’s Got This” slogan has a double meaning. He’s got the equipment (from Tommee Tippee, not by nature). And now the “ability” to “share” the responsibility for breastfeeding. 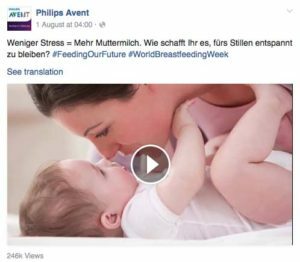 Nestlé actually state that it is a PROBLEM to breastfeed your baby when out and about – unbelievable! Just downloading the app out of interest. Nestle in Norway shrilly claims to adhere to the Code here and elsewhere while offering advice on infant nutrition directly to parents on line and through a toll-free phone number. They have repeatedly approached the mother-to-mother organization Ammehjelpen for ‘collaboration’ as they want to know what they can do to change our ‘unreasonable’ attitude towards them. We have restricted our contact to replying to their emails with the one thing they can do, namely, adhere strictly to the Code in intention and in deed, in every country and every locality where they do business. It isn’t as though the Code is ambiguous on these points.